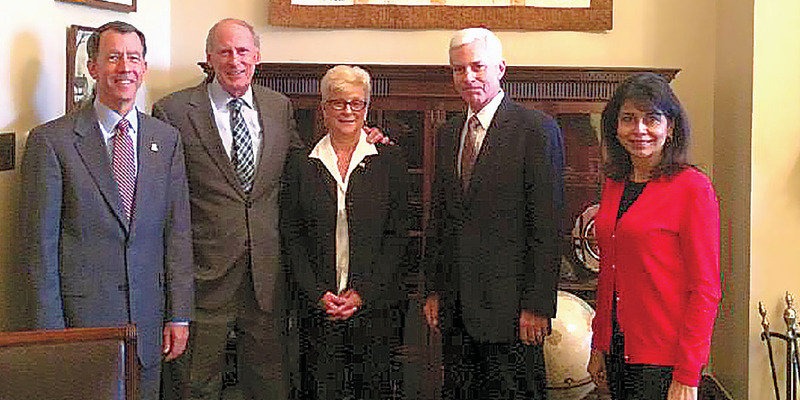 From left: On Advocacy Day, NACUBO Board Chair Gregg Goldman and Sen. Dan Coats, (R–IN), participated in conversations about higher education issues with NACUBO member Claire Stinson, vice president, planning and finance, Tennessee Technological University; John Walda, NACUBO’s president and CEO; and member Sue Tavakoli, vice president, administrative services, Estrella Mountain Community College. The group thanked Coats for his leadership on 1098-T legislation. In September, members of NACUBO’s four constituent councils representing community colleges, comprehensive and doctoral institutions, research universities, and small institutions convened at NACUBO offices in Washington, D.C., for their annual planning meetings. Each council focused on identifying priorities and issues affecting its specific institution type. Council members also participated in discussions about NACUBO’s long-range strategic plan, and provided feedback on three NACUBO initiatives: succession planning, determining employer and external stakeholder expectations of higher education, and measuring student success. The councils’ ideas and recommendations will influence upcoming professional development programs, publications, webcasts, and Web resources, among other products and services. While in Washington, council members—along with members of NACUBO’s board of directors, NACUBO President and CEO John Walda, and other staff—met with policymakers on Capitol Hill to illustrate efforts by colleges and universities to find cost efficiencies and stretch resources. On what NACUBO calls its Advocacy Day, more than 40 congressional offices from 20 different states were briefed on the association’s perspective on the Pell Grant program, reauthorization of the Higher Education Act, and a number of federal tax policies. In the current environ-ment, there is increased pressure on institutions to ensure that academic offerings are aligned with students’ needs. Subsequently, it is critical for chief business officers to be equipped with a proven process to guide the growth of these academic programs. During a recent NACUBO webcast, A Financially Sustainable Approach to Innovate Academic Programs, speakers from Marist College, Poughkeepsie, N.Y., and Grant Thornton discussed how five-year financial models have been developed at institutions to manage growth, change existing programs, and develop faculty. Attendees learned how previous efforts to apply activity-based costing to academic programs can be leveraged in ways that allow a more strategic analysis of program expansion options. Speakers also illustrated effective collaborative roles involving the CBO, provost, and chief operating officer in developing sustainable growth models at tuition-dependent institutions. In June 2015, NACUBO and EDUCAUSE brought together nearly 200 business and finance, information technology, and institutional research thought leaders in Seattle, to discuss ways to enhance their institutions’ analytics strategies. Attendees and presenters concluded that significant enhancements could be achieved by working more closely together across the campus to gain support from executive leadership; developing staff resources and expertise; and fostering a culture that values analytics-driven decision making. The group further identified the need to focus on processes and culture before acquiring new tools or collecting additional data. A complete report on the summit proceedings is available on the NACUBO website. For more information, visit the “Technology” page under “Business and Policy Areas” at www.nacubo.org. For the latest information and strategies related to strategic debt management and endowment performance, attend the 2016 NACUBO Endowment and Debt Management Forum (EDMF). This leading conference on the financing of higher education will take place February 3–5, at the Waldorf Astoria in New York City, and feature keynote speakers such as Alan S. Blinder, Princeton University economist and former vice chairman of the Board of Governors of the Federal Reserve System; Robert C. Doll, chief equity strategist at Nuveen Asset Management LLC; David Kelly, chief global strategist at JP Morgan Asset Management; and Lacy H. Hunt, economist, author, and executive vice president at Hoisington Investment Management Co. The forum also offers opportunities to network with and hear from other chief business officers committed to optimizing their institution’s financial performance. Lee White of George K. Baum & Co. and Roger Goodman of the Yuba Group will moderate practitioner panels on debt management. Monica Issar of J.P. Morgan and Kathryn Karlic of TIAA-CREF will lead panels featuring chief investment officers, chief financial officers, and investment committee members.